Binta Nyako, the presiding over the trial of the leader of Indigenous People of Biafra, Nnamdi Kanu, has ordered for a secret trial of the IPOB leader and his co-defendants. After reading out the arguments of the defendants and prosecutors, judge Binta ruled that her court will give room for masking of witnesses. "I hearby rule that,the mask witnesses will testify. We shall provide special route for entrance's and exit, for the witnesses. I also state that,from now to Thursday this week,the counsels should come to court and see how the secret trial works. "We will arrange the court and even Lawyers, Journalist etc" judge Nyako stated. A drama ensued in the court, as Nnamdi Kanu rejects rthe injustice from the witness box. "This is injustice, Buhari said he will not grant me bail and now the judge is talking about secret trial,this is injustice and I will not subject to it" Mazi Nnamdi Kanu thundered in the court, backed by Benjamin Madubugwu, who rebuked the secret trial as well. 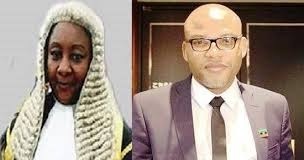 Barrister Ejiofor, however pleaded that the health of his client is severely deteriorating, and therefore should be released; but Binta Nyako, replied him in a somewhat like harsh manner. Binta Nyako: "Tell me how you want him to get medical treatment? All this things you are talking about,is sentiment. I have refused to grant him bail,so what other step do you want to take?" Barrister Ejiofor: "I want him to be released. My client is very I'll and should be released." Binta Nyako: Benjamin, if you continue to speak that way,I will agree you are a nuisance in my court. The defendants are infuriating stating that, they were accused in the open and must be tried in the open. The defending counsels are calming their clients and are trying to fix a date for the case. The case has being adjourned to 10,11 and 12th of January. Ibeh Gift Amarachi and Ngozi Kanu of Family Writers reporting live from Federal high court Abuja Nigeria.